I ask this question to you in two ways, one I want you to in a blog post describe what kind of teacher you’re training for in the K-12 system. 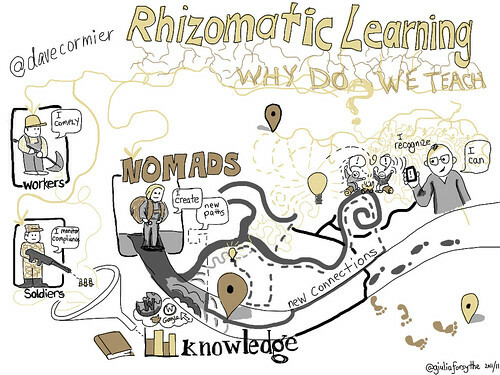 And second I want you to read Dave Cormier’s Rhizomatic Learning – Why we teach? and respond to the questions he asks in the activity described at the end of his blog post. You may consider finding an image, video, and/or text to support your descriptions (encouraged actually). Also if you don’t already have one, please create a Google account. You will need this account to work with the many document tools Google has. Please play around with some of them. This entry was posted in EdTech DEW Lines, Rhizomatic Teaching Plans and tagged Google Docs, Rhizomatic Learning, teaching by Prof. Michael Smith. Bookmark the permalink. I’ve been tracking around your site reading some responses. Anything about the discussions you’ve had in class that particularly jumped out at you? Dave thanks for jumping in this past winter engaging my students. I’m sorry I hadn’t replied at the time, I was hacking my way through the course for the first time and got overwhelmed by the posting and comments by students (a good thing). I’m about to present your ideas on Rhizomatic learning again in my summer course, and am excited to see the students’ responses.